Explore the Corolla Hatchback from every angle. 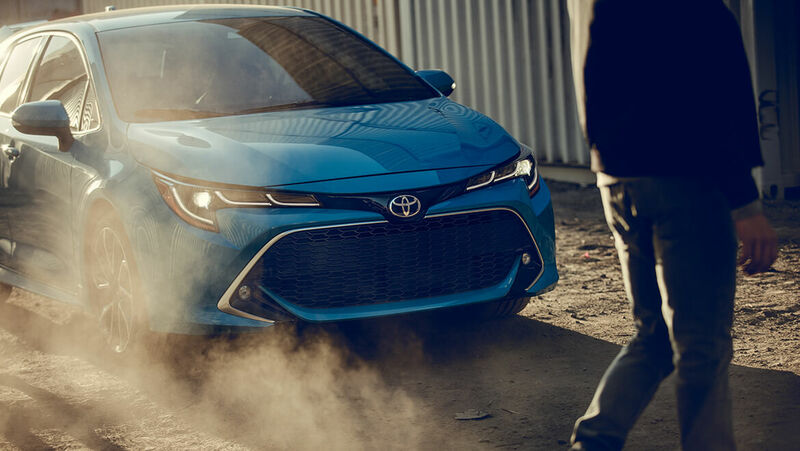 Download the brochure to see customizable options, features and everything else the 2019 Corolla Hatchback has to offer. No one knows how to take care of a Corolla Hatchback better than Toyota Certified Technicians. Manufacturer’s Suggested Retail Price excludes tax, tag, registration, title and dealer fees. Optional equipment not included. Actual dealer price will vary. Drivers ?are responsible for their own safe driving. ?Always pay attention to your surroundings and drive safely. Depending on the conditions of ?the ?roads, ?weather and the vehicle, the system(s) may not work as intended. See Owner’s Manual for ?additional limitations and ?details. Apple CarPlay is a registered trademark of Apple Inc. Apps and services subject to change at any time without notice. Amazon, Alexa, and all related logos and marks are trademarks of Amazon.com, Inc. or its affiliates. Not all Amazon Alexa skills are available for in-vehicle use. The Pedestrian Detection system, part of the advanced Pre-Collision System, is designed to detect a pedestrian or bicyclist ahead of the vehicle, determine if impact is imminent and help reduce impact speed. It is not a collision avoidance system and is not a substitute for safe and attentive driving. System effectiveness depends on many factors, such as speed, size and position of pedestrians, and weather, light and road conditions. See Owner's Manual for additional limitations and details.